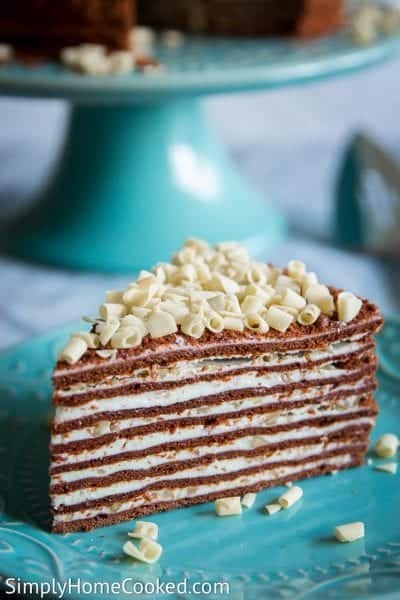 Spartak Cake is a delicious layered chocolate and honey cake that is a rich and creamy with just a hint of crunch from the walnut tucked between the cream-filled layers. If you like traditional Russian desserts, make sure to check out my homemade Kiev Cake as well. It is another delicious dessert that features Eastern European flavors. This recipe was originally posted December 20, 2017, we’ve tweaked it a bit since then. This post may contain affiliate links. Read my disclosure policy here. This chocolate honey layer cake has been a family favorite for many years. 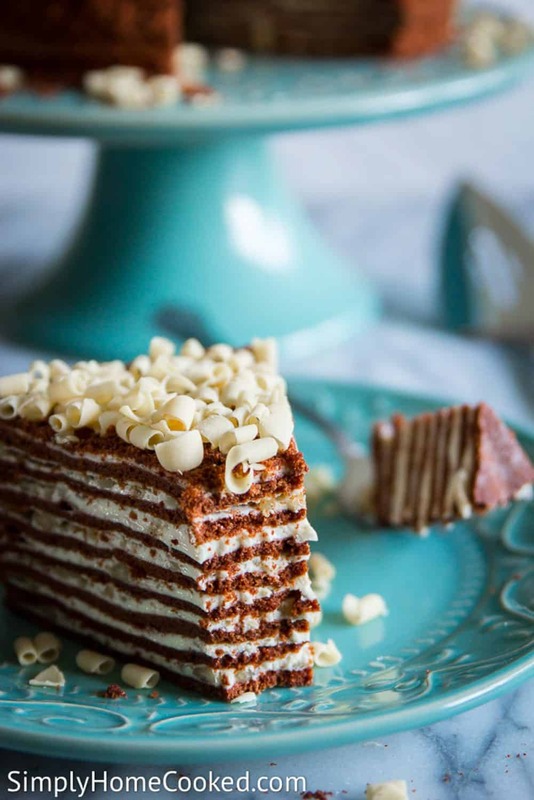 Spartak cake is a traditional Russian dessert that takes time to create, but is worth every rich sweetened bite. We especially love to bake it during the holidays. 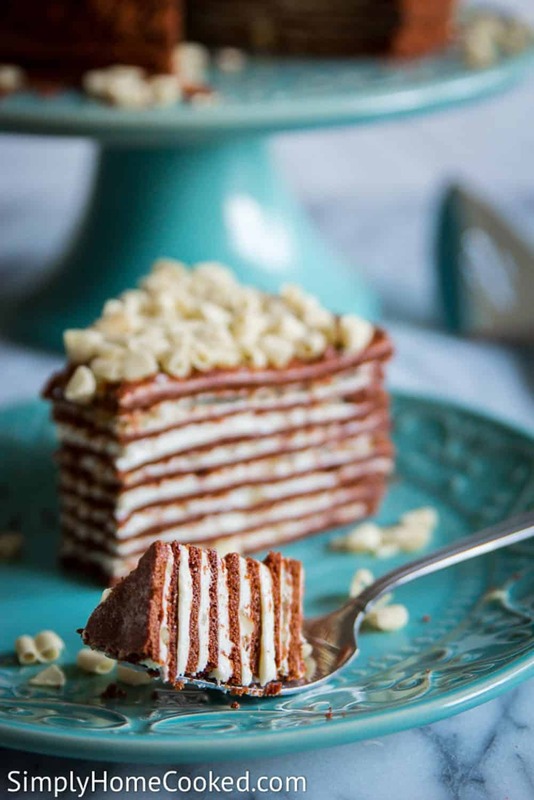 It’s made of 8 thin chocolatey layers and stacked between a sweetened condensed milk cream and finely chopped walnuts. It’s a delightful dessert worth the time and effort. The moment you take your first bite you’ll know exactly why. Before you begin, print the recipe out (below) and read over it to familiarize yourself with the steps as this is a longer dessert to make. You will begin the process with a traditional method of making a creamy filling by beating butter with sweetened condensed milk and other ingredients as directed. To prepare the cake layers, you will begin with beating down sugar and eggs before adding in other ingredients. 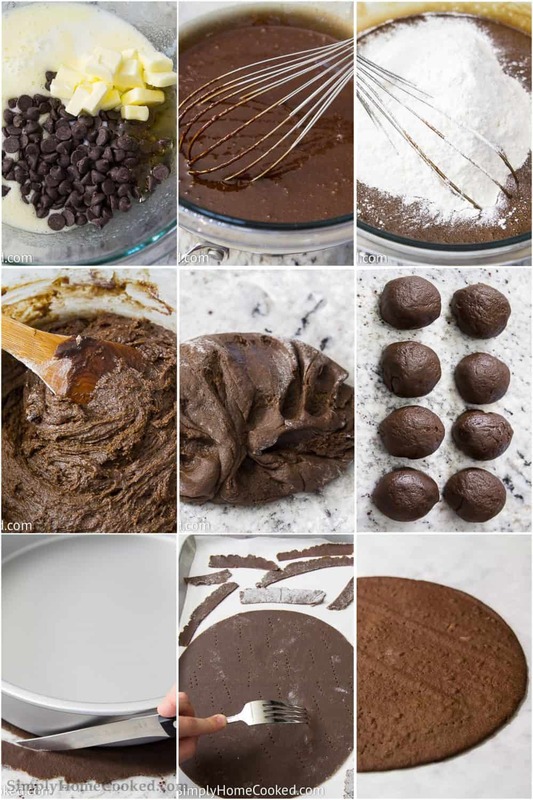 Follow the directions carefully for melting the chocolate chips and combining with other ingredients. Once the dough is formed, you will divide it into 8 equal pieces. Each of these pieces will be rolled out and cut to create a layer before baking. Once you have baked the cake layers and allowed them to cool properly, you will begin building your layers. Begin with a piece of the cake layer, then spread the cream filling and chopped walnuts over the layer. Continue this process as directed in the printable recipe until you have all layers in place. 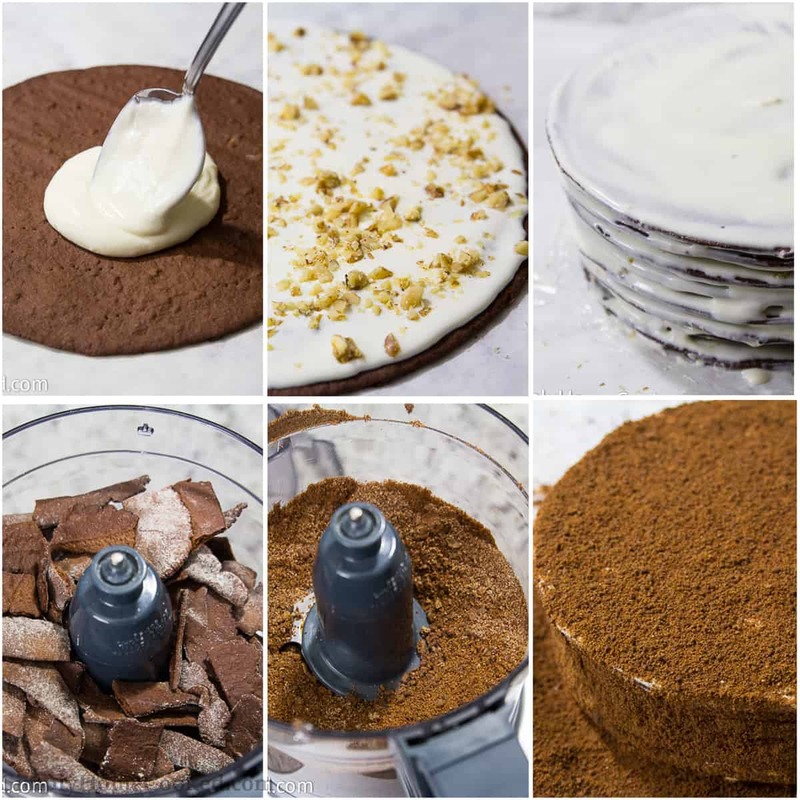 Your final step will be to use leftover cake crumbs to coat the outside of the cake and to sprinkle chopped walnut son top of the cake prior to serving. Note: This cake is best served the next day. After assembling, keep the cake in room temperature for at least 3 hours, then refrigerate. Along with this delicious recipe for layered chocolate and honey cake, you will love some of our other linked cake ideas below. 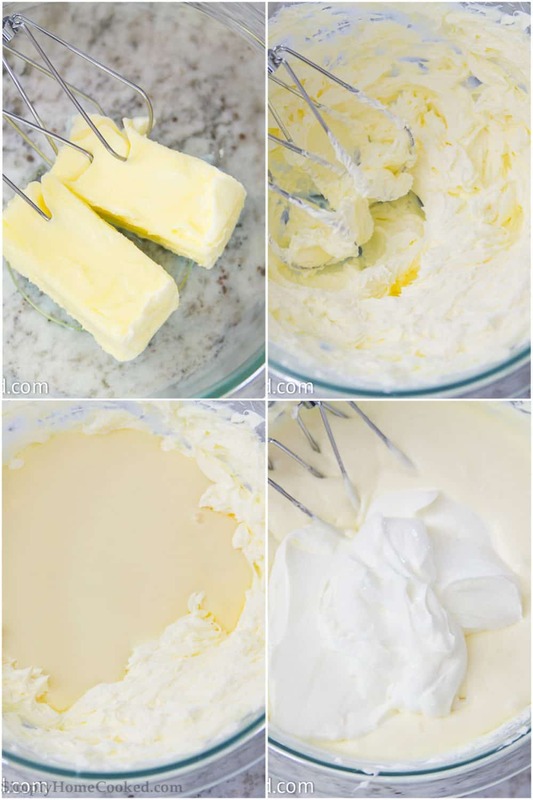 In a bowl, begin making the cream by beating 1 cup softened butter with an electric mixer until light and fluffy. Then add the sweetened condensed milk and mix to combine. Add the sour cream and blend just to incorporate. Don't over mix. Begin making the cake by beating sugar and eggs in a large bowl using a whisk. Add the milk, honey, butter, and chocolate chips into the bowl. Place the bowl over a pot of simmering water (double boiler) and stir with a whisk until the butter and chocolate melt. Then add the baking soda. Stir for an additional 8 minutes. Divide the flour in half. Add the first half and stir to incorporate. Then add the second half and stir until it is well incorporated. Place the dough onto a lightly floured surface and work into the dough with your hands. Form it into a log. Divide the log into 8 equal pieces. Roll each piece out into a very thin circle (about 10 inches in diameter). Place a 9 inch baking pan over the dough and trace around the pan with a knife cutting through the dough. Place the rolled dough circle onto a baking sheet lined with parchment paper and generously poke the dough with a fork. Place the leftover dough scraps onto the baking sheet as well. You will need these for later. Bake the cake layers/scraps in batches at 350 degrees Fahrenheit for 10 minutes. Once the cake layers have cooled, pulse the baked scraps in a food processor until they become fine crumbs. Begin assembling your cake by spreading an even layer of the filling onto the first cake layer. Then sprinkle a small amount of chopped walnuts on top. Before adding the next cake layer, lightly spread a little filling on the bottom of the cake layer so there will be filling on the top and bottom of each layer. This will help the nuts stick to each layer better. This cake is best served the next day. After assembling, keep the cake in room temperature for at least 3 hours, then refrigerate. Pure PERFECTION! My 3 year old daughter requested a black and white cake for her Birthday and I decided to make this cake and let me tell you, it was the best decision made!!! All of us could not stop raving about this cake… soo soo delicious. I made once Spartak cake from another blog and it was not even near as perfect!!! I wanted a taller cake so made 13 layers of this delight. Seriously, if someone wants to impress a loved one(esp a chocolate lover), do not even second guess yourself… Make this cake! Worth the time. Thanks a ton for the step by step instructions and photos. Where do you purchase the white chocolate to decorate the cake? Hi Natasha, I purchased the white chocolate curls from a local store called harbor greens. Here is a link where you can get them from amazon.